I’ve been flying sixteen years now, and the specter of user fees has haunted the general aviation community the entire time. Longer, in fact. They’ve been proposed again and again over the ensuing decades, and every time we have managed to fight them back. But something tells me the day is coming when we’re going to tell fantastic stories to future generations about the days when it was possible to crank over the engine without writing a check to the federal government (and probably being monitored via ADS-B, video cameras, data recorders, and more — but that’s a battle for another post). The proposal isn’t for the Feds to collect the taxes, but rather to allow states to do so. Still, think about this for a moment, and look at the statistics on passenger vehicles in the United States. There are more than 250,000,000 cars on the road in this country, and we produce more than 10.5 million of them annually. Compare that with the virtually non-existent production of GA airplanes and the approximately 200,000 airframes in our national fleet. As helpful as AOPA and it’s 400,000 members may be, they pale in comparison to the Automobile Club’s 54 million, not to mention their 40,000 full-time employees or the army of Washington lobbyists at their disposal. If the U.S. auto industry can’t keep our country’s 47,000 miles of freeways from devolving into tollways, what chance does general aviation have? How would political support for avoiding user fees hold up among the Congressional General Aviation Caucus when every American with a car had to pay them on a daily basis? That’s to say nothing of the gas tax, which I’m sure would continue to be levied just as our aviation fuel taxes would be in the event of a user fee implementation. We shouldn’t be surprised by this development. Major cities like London and Singapore have had congestion pricing schemes for years, and the same thing is in the works for the U.S. One look at the federal expenditures shows how entitlement spending is eating up a larger and larger percentage of a budget which is already hundreds of billions in the hole each and every year. 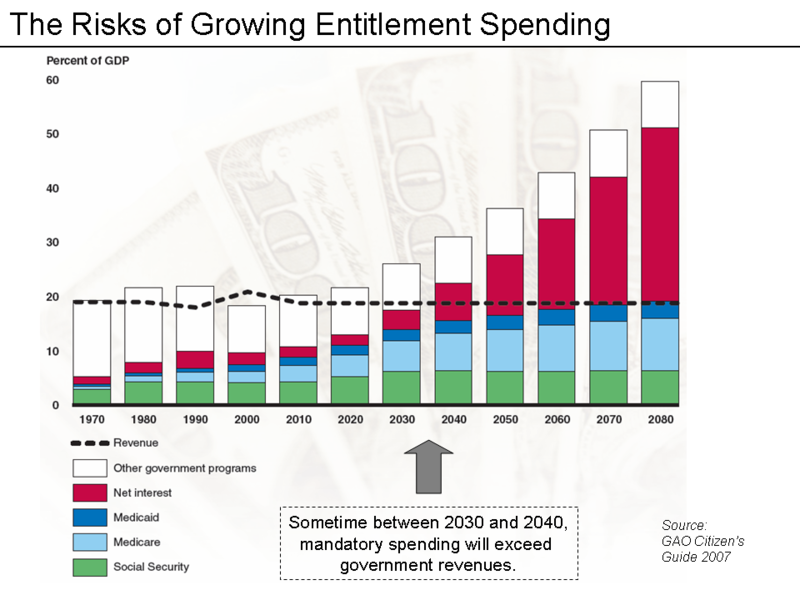 The government’s own estimate of how entitlement spending will consume the entire budget. I don’t want to get too deep into the political rabbit hole here — tempting as that may be — but whatever your inclination toward American social spending, there’s no debating the fact that we are approaching a day when that spending will consume every penny of the budget, no matter what happens on the revenue side. So keep watching, because you’re going to see taxes on every single thing you do, and aviation will be near the top of the list. Let’s face it, the freeways were never really free. I think one day kids will ask about why they’re called “freeways”, just as they now inquire about how scenic Orange County got its name (hint: they used to have a lot more agriculture here). The gas tax may not have been indexed to keep up with inflation, but there is a mechanism for raising it, and drivers pay that tax every time they fill up. I probably don’t need to articulate a list of reasons why tolls are a poor idea, but if you’re interested in a list here’s a pretty compelling start. My concern about user fees has more to do with the precedent than the amount. Even if it was a nickel, the problem is that the door is open and it’s quite easy to raise the levy. Pretty soon they’re removing a Washington from your wallet. Then a Jackson, and before you know it a Franklin. Or two. Every time you want to fly. Perhaps that’s how this could end: you’ll have all the freedom in the world to fly, just as they do in Europe. But there’s no way anyone could afford it. So it might be time for us to shift our efforts toward stopping transportation user fees in general. If drivers don’t raise much of a fuss about this, passenger vehicles will be saddled with it, and you can bet we’d be next. This post first appeared on iFLYblog as part of the “Blogging in Formation” aviation series. ← Learning to Fly — Without An Instructor? This post implies it, but I’ll just say it openly. User fees, as proposed, such as to mimic our cousins across the pond. Say we are assessed a $50 landing fee and a $75 user fee for each time we talk to ATC, it could mean our trip fees would out pace our fuel and Mx fees. So as much as we want to crank over the engine and fly off into the blue, you are right, we have video cams, ADS-B, surveillance and data recorders to be unable to skirt this issue. The roads are a wonderful privilege, and I am happy to pay taxes for them, just not to toll each time I use them, but the air molecules in the sky? I don’t think so! Bottom line, it would be a nail in GA’s coffin, in my opinion. Speaking of Orange County and Tolling, I used to have a running joke. Since we have toll roads here, the toll booth attendants would work next to the automated toll machines. I used to joke that don’t these folks come to work each day and have the feeling each day that this machine will one day take their job? It gives change and lets you through a Toll. Well, it finally did, this month, in 2014 and all Toll Booth collectors are no longer at work. What replaced them? an APP! You just have to have an app, where you place your credit card in and when you pass the toll, your license plate triggers the account and the funds deducted. Yes, I’ve noticed the signs proclaiming the “era of cashless tolling”. Now it’s easier than ever to have absolutely no idea how much they’re charging you to drive on that road. Out of sight, out of mind. Some of the tolls are dramatic. South O.C. to John Wayne costs nearly seven dollars! It wasn’t long ago you could get anywhere for a couple of bucks, yet despite the rise in toll rates they’re still losing money. If you want to know what user fees for aviation will look like, there’s your answer. Oh, and P.S. you’ll still pay the aviation fuel tax as well. 1) The federal gas tax hasn’t kept pace with the fact that cars have become more fuel efficient and thus use more gas and the fact that Americans are driving fewer miles. This is what’s driving shrinking of the Highway Trust Fund, not so much the run away spending people like to yell about. That may be true in other parts of the budget, but not really here. I’m not a bean counter, and don’t have a lot of experience reading budgets, but looking at the estimates for ’14 on page 14 of the Other Information By Appropriation section, what jumps out at me are, outlays between ’13 and ’14 are relatively flat, except for one section called, Trust Fund Share of FAA Activities, which has increased this year by ~ 1.4 billion. What gives here? Did the FAA get its budget cut and is making up for it from the Trust Fund? Is this Next Gen costs? If so, given it’s been in development for years why is it costing 1.4 billion more in ’14? I honestly don’t know and would be good to find out. Incidentally, I was quickly trying to google the budget line item (?) 021-12-8104-0 for the Trust Fund Share of FAA Activities to see what kind of things that funded and it brought up previous years FAA budgets. It seems this number has vacillated between 5 and 6.x billion before in prior years: ’08, ’09 and ’10. Welcome, Dave! Thanks for the thoughtful comment. I believe you are correct, the increased Trust Fund withdrawal of $1.4 billion most likely is for NextGen development. The FAA is scheduled to spend more than a billion dollars on it this year alone. It’s ironic that so much money is being spent on the system when the FAA’s own data show that air traffic has shrunk dramatically over the past 15 years. If you look at page 12 of the “Operations – ATO – En Route and Oceanic/Terminal Services” section of the budget, you’ll a graph showing FAA-serviced air traffic operations decreased from 54,000/day in 2000 to about 39,000/day in 2014. It also shows that traffic is not expected to return to 2000 levels until sometime after the chart’s estimates end in 2027. Of course, you don’t have to dig into the FAA’s budget to see that. Look at any airport. Talk to any flight school or FBO about how much business they’re seeing today versus a decade ago. On the airline side, virtually all airline flights are filled to capacity these days while air carriers cut the number of flights and destinations served. It’s the only way they can stay alive with the cost of doing business so high. Despite the benefits it would provide, the data indicate that we need NextGen less than ever before. What the U.S. aviation community really needs is to lower the cost of flying by any means possible in order to preserve the industry, which is shrinking rapidly on all sides.